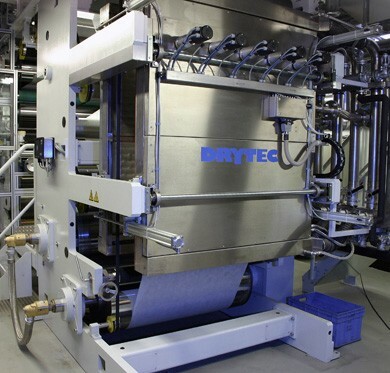 With homogeneous humidification of paper using DRYTEC conditioning systems, the required moisture content of the substrate is achieved without excessive humidification of the paper surface. The controlled condensation of the saturated steam in the capillary paper structure increases the humidity of the paper to the level required for subsequent processing while at the same time eliminating tendencies to curl, paper stresses and humidity fluctuations. The HSR humidifiers (High Speed Rehumidification) are favoured for use with high track speeds.